Dictionaries claim to define plenty of words, but do they really tell you what the things in life mean? No. 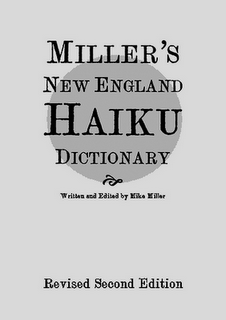 Hence, Miller’s New England Haiku Dictionary, the handy little book that settles all those doubts once and for all, and somehow manages to do so in 17 syllables every time. Miller’s New England Haiku Dictionary can be order through Drafty Attic Press for $5.00 (plus $3.00 shipping and handling). As a means of expressing our gratitude to our featured poets, Four and Twenty happily announces the release of their new books. The above content was provided by the author. It is neither a review or an endorsement of the author’s work. This entry was posted on Thursday, February 17th, 2011 at 10:26 pm and is filed under Announcements, Four and Twenty Author Release. You can follow any responses to this entry through the RSS 2.0 feed. Both comments and pings are currently closed.